Pest Expert Formula 'D' Flea Killer Powder is a unique formulation of Diatomaceous Earth which is a highly effective flea killer and an essential part of any flea treatment. Natural and pesticide-free, so safe for use around pets. Formula 'D' Flea Powder is a highly effective contact dust which kills both dog and cat fleas and can be used as part of a comprehensive treatment. Containing 100% Diatomaceous Earth, Formula 'D' is a natural, pesticide-free flea killer with an excellent knockdown effect. Sprinkle Formula 'D' Flea Killer Powder at a rate of 10g (50ml) per square metre. When applying to carpets, work the powder in with a soft brush. Apply broadly and pay specific attention to wall/floor crevices where insects harbour and fleas often lay their eggs, and areas where pets lie and rest. Treated areas should be vacuumed after 5-7 days to remove dead insects and Formula 'D' should be reapplied if the infestation persists. 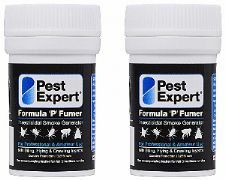 For a more comprehensive treatment, we would recommend use in conjunction with our Pest Expert Formula 'C' Flea Spray and Formula 'P' Flea Bombs to fumigate the room. Please also see our Flea Treatment Kits which contain a range of our best performing products. Excellent 👍👍👍 The fleas didn't last long after the first application! Does what it says on the tin, good effective products delivered on time! Really fast delivery and product works! Good value for money, highly recommended! Good web site, easy to find the products and information that you need! The flea powder was fantastic and the fleas are gone! Just fantastic! Used the natural powder as I didn't want to harm my dog and by gosh did it work! So pleased with the results! Highly recommended!